The lumbar spine is the most commonly injured body part. The driver swing speed of an average female golfer is 62mph; 96mph for an average LPGA professional; 84mph for an average male golfer; 108mph for an average PGA Tour player. Tiger Woods’ average swing speed is 130mph. TLack of warm up, improper swing mechanics and excessive practice are the primary causes of injuries. Seek the advice and treatment of a Physical Therapist to avoid injuries and/or treat an injury. Golf offers universal appeal: contemplative time alone or time spent with friends and colleagues; competitive for the young and energetic as well as aging players; challenging for body and mind. When you play golf, you use your whole body and could potentially hurt yourself. Proper conditioning is essential to avoid golf injuries. This sport requires the body to bend, twist, reach, stretch, sit, stand and walk for an extended period of time. A round of golf takes several hours to complete. During that time, golfers navigate various terrains with precarious postural positions. The ball does not always end up on flat, fairway surfaces, making ball retrieval more difficult and riskier. At some point, all golfers try to swing from positions that can lead to excessive forces being applied to a body part that is not accustomed to them. The excessive force cannot be resisted and something “gives,” resulting pain and possibly a protracted injury. Low Back: The lumbar spine has 5 vertebra that are held together with leather like ligaments and muscles that provide movement and dynamic stability. The lumbar spine does not rotate a great deal on its own and is dependent upon other body parts to provide additional rotational motions. The hips, knees, ankle and feet help to rotate the spine from the below and the thoracic and cervical spine help from the top. The proper golf swing requires the head to remain still and this can lead to added stress on the lumbar spine. Shoulders and elbows: The shoulder and elbow joints can be “over-used” during a round of golf and lead to “over-use” type injuries. Most golfers do not have traumatic injuries on the golf course, but if they “miss hit” a ball it can lead to a jarring sensation throughout the forearm and into the elbow joints. Improper gripping of the club handle or twisting of the club during the swing can lead to elbow and shoulder injuries. The motion of the shoulders during a golf swing is not a normal, every-day motion and the golfer might swing in excess of 3-500 times in a day of golf. Most golfers don’t include the practice range swings and practice swings before each shot when they are trying to recall how they injured their shoulder. Knees: The rotational motion in the knee can be excessive during the golf swing. The joint is labeled a modified hinge joint. The round femoral condyles at the end of the leg bone or femur sit on a flat plateau of the top of the shin bone or tibia. The anatomy allows for a limited amount of rotation in the joint. If the rotation force is too great, internal damage can occur in the knee. The lead knee on the “follow through” leg is more susceptible to these excessive rotational forces. The golfer can also experience knee injuries due to walking on the uneven golf course terrain. Even if the golfer “takes a cart,” there is a lot of walking involved on uneven surfaces. Squats: Stand in front of a chair as if you are going to sit down. Your feet should be shoulder width apart. Begin to “sit” down slowly and barely touch your buttocks to the chair seat. Return to an erect/standing position. Pull –a- parts: Stand and hold a piece of Theratubing (Rubber tubing can be purchased at most sporting goods stores or ask your Physical Therapist for a piece) of appropriate tensile strength in your hands. Your arms should be at or near shoulder level and your elbows should be fully extended (straight). Your palms should be facing each other so that your thumbs are pointed towards the ceiling. Slowly move your arms apart and stretch (“pull apart”) the Theraband. Your goal is to get your hands spread apart with your elbows straight and in line with your shoulders. In the event that you suffer an injury while playing golf, seek a diagnosis and treatment from a Physical Therapist. 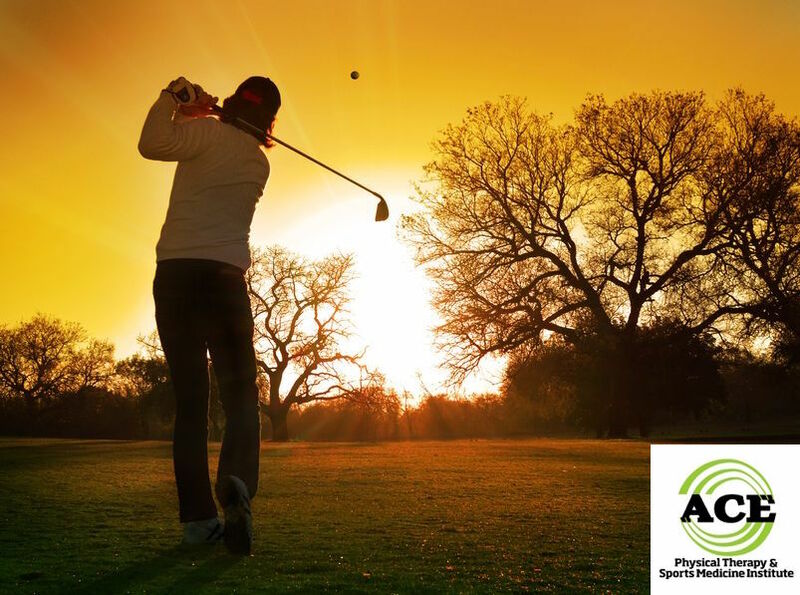 You do not have to see your doctor first and the Physical Therapist is a licensed healthcare professional that is trained and educated to treat musculoskeletal injuries similar to the kind a golfer might experience. Golf is a challenging game that can cause an injury to the golfer if they are not prepared to play. The forces that occur throughout the human body during a round of golf can be excessive, repetitive and cause an injury. The proper preparation can help prevent injuries and improve your golf game.